Three weeks ago, I mentioned the “Boko Haram” crisis that rocked parts of Northern Nigeria. A newspaper article on the incident had forced me to send a “beware” to kingdom citizens about the dangers of becoming inappropriately obsessed with the promised kingdom of our Lord to the detriment of our fortunes in the present time. But it is evident that we’ve been having a hard time achieving the balanced attitude proposed in the article. Why do I say that? Another “tsunami” – as it has been dubbed in the media – has ripped through Nigeria, leaving in its wake the necessity of yet another warning. This time around, it is about the dangers of getting unduly entangled “with the affairs of this life” (2 Timothy 2:4) to the endangerment of our heritage in the coming kingdom. Before the outbreak of the present turbulence in the Nigerian banking industry, there had been the rumor, including in the international media, that all was not well with Nigerian banks. But this is Nigeria where too many things are in shades of grey, and so common folks hardly knew white from black. Then there was a change at the helm of the Central Bank of Nigeria (the industry regulator), ten of the country’s twenty-four “mega banks” were passed through the x-ray and five reported to be in severe trouble. Like a tornado out of nowhere, the MDs/CEOs of the ailing banks (some of them “owners”) were given the boot and new executives unilaterally installed – thanks to some expansive powers accorded to the Governor of the Central Bank in the books. A lifeline was extended to the banks in the form of temporary injection of public funds and new investors invited to express interest. I was largely indifferent when the whole thing started. But soon the details started filtering through and I discovered the very five banks that were supposed to be sick. My reaction was radical. Up went my red flag: “No way – that can’t be!” Then onward, I was interested. Why? Two of the affected MDs/CEOs are prominent members of the biggest Church in Nigeria, overseen by one of the most respected ministers in the country, known globally. Frankly, I have been an admirer of one of these bank executives and the ordinary perception was that his bank was one of the biggest and best in the country. Indeed, he is the current President of the Chattered Institute of Bankers of Nigerian and the African Banker Magazine named his bank African Bank of the Year 2008, just as the World Bank/IMF/ Renaissance Group awarded it Financial Brand of the Year 2008. He has also been announced a nominee for Banker of the Year 2009 by organizers of the Nigerian ThisDay Awards. Talk of a bestriding colossus! In the last three years, the bank of the other, a lady, was also named Bank of the Year in Nigeria by the Banker Magazine, a special publication of the Financial Times of London. This is just a peep on the reputation of the duo. So what went wrong? There have been allegations of a “hidden agenda.” Even among those who hailed the intervention of the CBN, there has been talk of a good medicine administered a bad way. In a nutshell, we are yet to hear the last of the matter. We are still watching to see how things will play out. I will admit it: I am sympathetic – for obvious reasons. Indeed, in my desperate sympathy, I tried to excuse the alleged violations of the Christian brother with the biblical injunction, “The law is not made for a righteous man, but for the lawless and disobedient” (1 Timothy 1:9). But that leads us right to the heart of the point of this article. Truth is, “the law” in the foregoing verse is strictly the Law of God, and as the Lord warned, “My kingdom is not of this world” (John 18:36). This says much more than we, Christians, are want to face up to. So, even if there is a “hidden agenda” in this affair that the brother has been caught in, it is evident that his bank, and the indicted others, transgressed the law of “this world.” Perhaps he doesn’t quite realize it, but “this world” is a place where, by his public identification with the Lord, he has become a marked man. His case might therefore be an instance of what my Yoruba people proverbially speak of: a man sentenced to death by burning, who thought of nothing better than to soak himself in petrol (gasoline). Talk about hastening his own death. He has been credited with the claim that his bank is built on the foundation of Christ. Impressive. And for the records, everything a Christian initiates must be built on the foundation of Christ. But, truth is, without care we can offer the same to the enemy on a platter of gold. All it takes is taking it beyond the borders of Canaan and marrying it to the “heathen.” (Let’s meditate on Ezra 9:12). As I write this, the Christian brother is “at large” and has been declared wanted by the law. This is most unfortunate and disheartening, a blotch on his garment. Episodes like this are entirely avoidable if only we would heed the warning of the Lord, “My kingdom is not of this world.” It was echoed by His apostle: “Mind not high things, but condescend to men of low estate” (Rom 12:16). Again, “For here have we no continuing city, but we seek one to come” (Hebrews 13:14). Again, “No man that warreth entangleth himself with the affairs of this life; that he may please him who hath chosen him to be a soldier” (2 Timothy 2:4). We could go on and on. We might want to recall that there was a time when the people saw the exploits and potentials of our Lord – yes, the Master Himself! – and were going make Him king. What did He do? He saw the trap and went AWOL! (See John 6:14,15.) I’m not poking fun, but, believe me, that is the time to go AWOL, not after you’ve been caught on camera with a “smoking gun.” Right at the end of that former ministry, the Lord was singing the same tune: “My kingdom is not of this world: if my kingdom were of this world, then would my servants fight, that I should not be delivered to the Jews” (John 18:36). Are you hearing anything? As I said in Thy Kingdom Come, there are some battles Heaven will not fight for us – at least not the way we might expect – and we had better not enter into them. The experience of this Christian banker is of course not the first of its kind, and while it is unlikely it would be the last, there’s no reason why it shouldn’t. Are we going to take heed, or are we going to continue exposing ourselves and the name of our Lord to ridicule, as we have been seeing in the Nigerian media? (See Romans 2:24,25.) 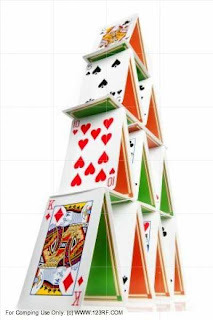 There are all sorts of projects and programs that we undertake “to the glory of God” that constitute little more than a house of cards, tell tale sings of the incursion of that appealing but futile and dangerous “Kingdom Now” doctrine (see Thy Kingdom Come). A strong enough puff of the wind and they would crumble. Nice folks once called the attention of the Lord to something much like these things and His assessment was: “See ye not all these things? verily I say unto you, There shall not be left here one stone upon another, that shall not be thrown down” (see Matthew 24:1,2). This was actually what set the stage for His detailed discourse of the last days of the present world system, wherein He warned of the troublous times ahead. Brothers and sisters, troublous days are ahead. Episodes like the one mentioned in this article are wake up calls. You might say someone is after you; if they are, it might be for your good. Perhaps you need something to shake you out of your snooze, cast you off your rosy bed, and start you crying, “Lord, Thy kingdom come!” Unless we get our acts together through these minor tribulations, some are going to walk straight into the “great tribulation” that the Lord warned of (Matthew 24:21). Worse, some might loose their kingdom heritage altogether and become fodder for the atomic age that will terminate the present world order. “Seeing then that all these things [our houses of cards inclusive] shall be dissolved, what manner of persons ought ye to be in all holy conversation and godliness, Looking for and hasting unto the coming of the day of God, wherein the heavens being on fire shall be dissolved, and the elements shall melt with fervent heat? Nevertheless we, according to his promise, look for new heavens and a new earth, wherein dwelleth righteousness” (2 Peter 3:11-13). As I wrote last week, the realization of this New Earth is the ultimate goal – the “hidden agenda,” if you like – of the coming kingdom of our Lord! So keep the faith and remain posted.